QBurst has rolled out a custom survey builder for SharePoint users. SurveyBuz is a convenient business tool for conducting online surveys. Developed as a SharePoint-hosted add-in, the app lets users quickly launch new surveys and collect feedback from within the SharePoint site. According to the SharePoint team at QBurst, SurveyBuz offers a unique set of features that make it especially useful to business teams. Surveyors can create a survey, add participants, and view the results of any closed survey in a few button clicks. Additionally, they can assign weightages to participants and view responses based on those weightages. They can also monitor the response trend as the survey progresses. 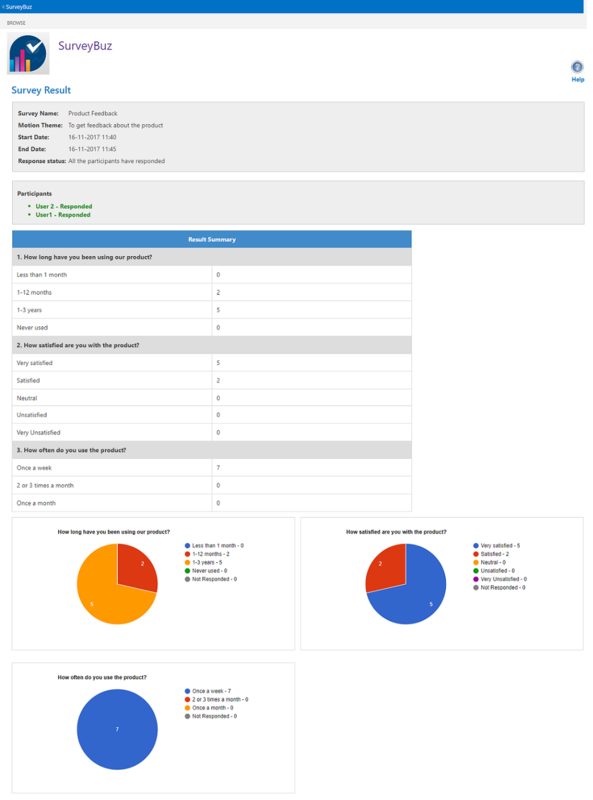 The results of surveys in SurveyBuz, which are visualized as charts and graphs for easy comprehension, are accessible to all users. Apart from these attributes, the QBurst app allows surveyors to schedule surveys for a later date. An executable program, which can be configured in the Windows Task Scheduler, will automatically start the survey and deactivate it when the time period ends. SurveyBuz is free and available at the Microsoft AppSource. Compatible with Chrome, Mozilla Firefox, and IE browsers, SurveyBuz can be integrated with SharePoint Online and SharePoint 2013+ versions. For more details or to get the executable file, write to us at info@qburst.com.